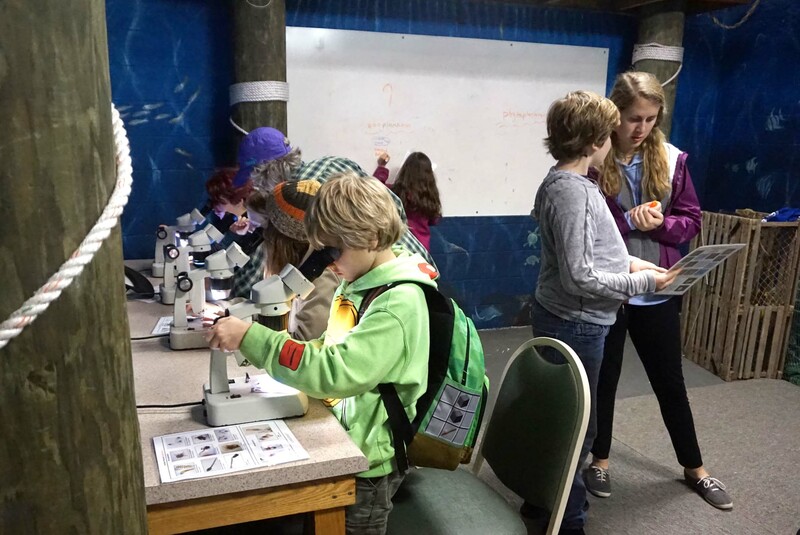 The Upper Elementary students observe water samples through microscopes during a session at Driftwood Education Center. It’s a word that’s packed with meaning for our older Montessori Tides School students, their teachers and chaperones. It’s a word that excites Lower Elementary students who hear about the amazing place called Driftwood, and it’s a word that brings memories to the Upper Elementary students who have gone there. Driftwood, for the uninitiated, is Driftwood Education Center in St. Simons Island, Ga. The Upper Elementary class has been visiting Driftwood for around 10 years as an overnight field trip. 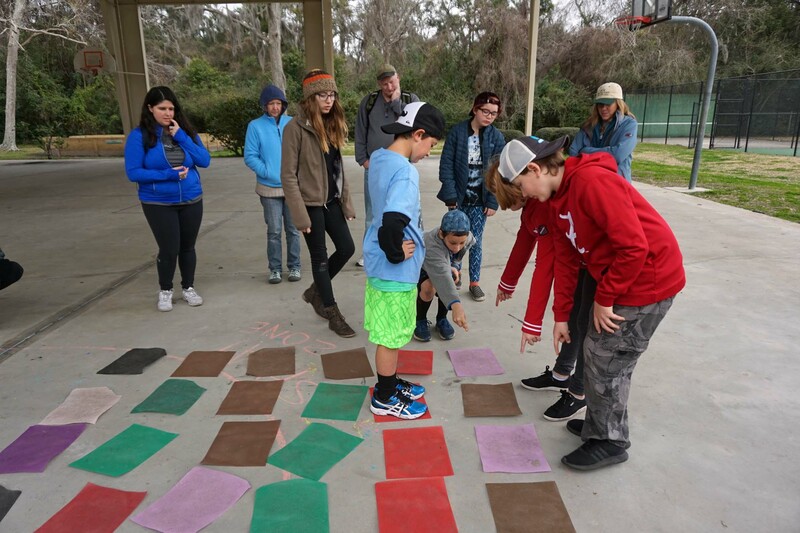 This year, the students spent three days and two nights in February at Driftwood with their schedule packed with fun and meaningful activities. Ms. Nancy, who left the Lower Elementary classroom to join the students on this year’s trip, said the teachers love Driftwood because the leaders are respectful to the students and the programs are in line with the Montessori science curriculum. During the comparative dissection of the fish class, she said one could tell the Upper Elementary students had been exposed to the vocabulary the Driftwood instructor used. 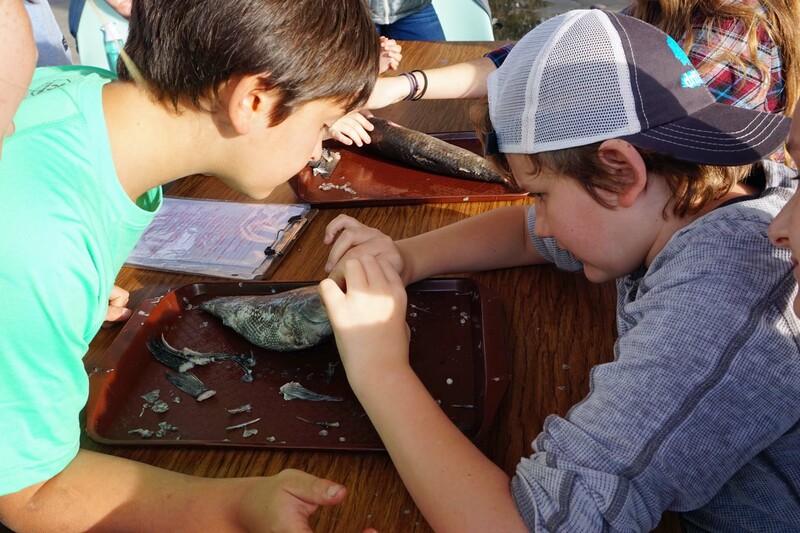 The session on comparative fish dissection allowed the Upper Elementary students to use the lessons they had in Lower Elementary. The terminology was quite familiar to Ms. Nancy since she had presented the anatomy of a fish lesson to her students just the week before Driftwood. It was nice to see how her former students had retained the information from Lower Elementary. For the chaperones, it’s a chance to return to nature since Driftwood is surrounded by trees and the Atlantic Intracoastal Waterway, and it feels miles away from civilization. 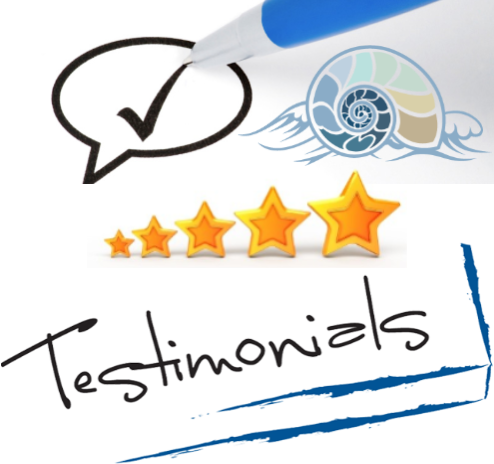 It’s also a place where one can always learn something new each year, one chaperone on her third visit said, calling Driftwood an “awesome” experience. 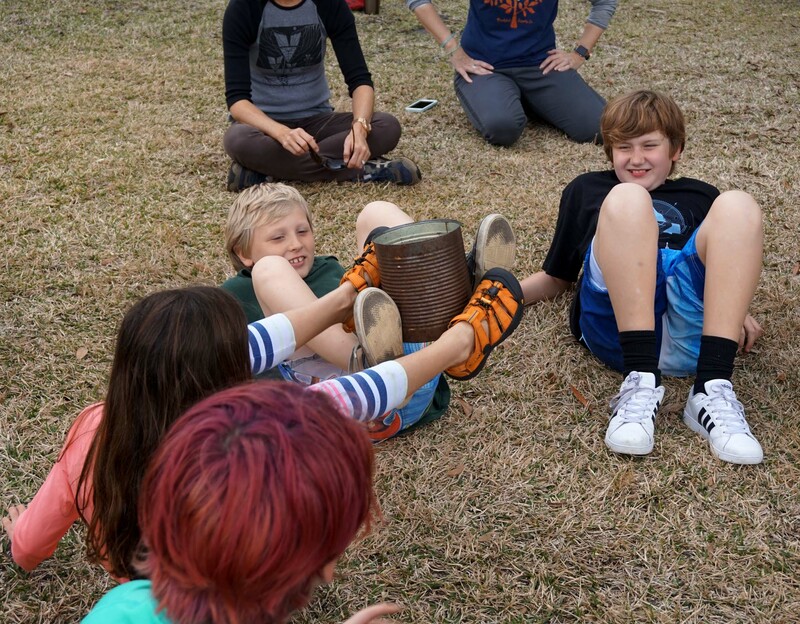 The Upper Elementary students use their feet to move a can of “toxic waste” around the circle during a team-building session. They weren’t allowed to use their hands. After arriving at Driftwood, the MTS group had a bit of time to get their beds in order before heading to lunch and their first activity, which involved “toxic waste.” The team-building session had the students working together to figure out how to pass a tin can of toxic waste (otherwise known as harmless balls) to each other without using their hands. 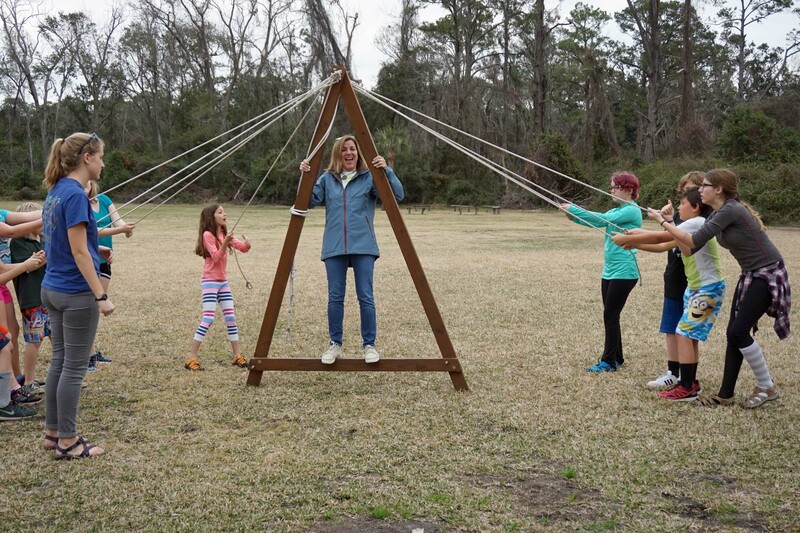 During a team-building exercise, the Upper Elementary students had to move an A-frame with ropes. Ms. Nancy jumped on the A-frame once they had figured out how to move it. Among several team-building exercises this session was one that involved trying to move a wooden A-frame using the ropes attached to the structure. Ms. Nancy raised the pressure on the students when she jumped on the A-frame, and they had to move the structure without toppling her! The highlight of the trip for many students, however, came the first day — the mud pit. 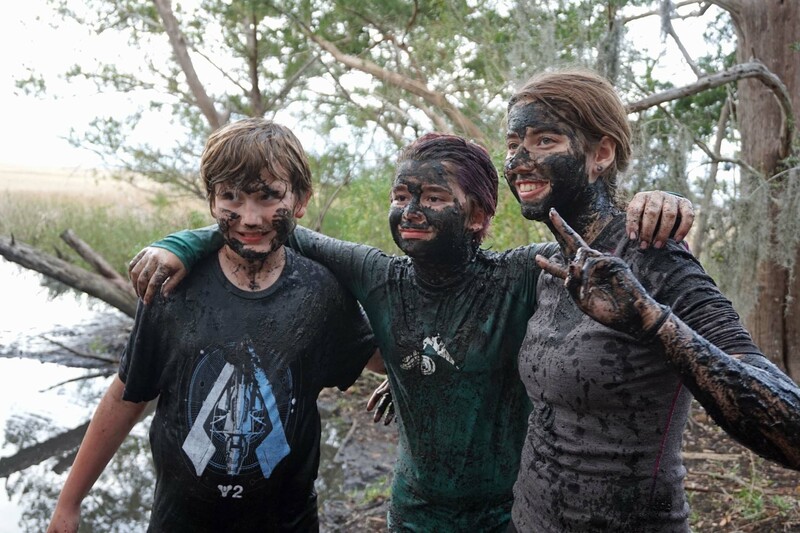 After discussions about food webs and mud, the group made the short hike to the edge of the intracoastal where they couldn’t wait to get dirty and become one with the mud. The mud pit is a highlight of the Driftwood experience and ends a session that involves a discussion about food webs. Each evening, the students had a group meeting, just like they do each day at school. They discussed safety, the schedule for quiet time and lights out, and even jobs for keeping their living spaces clean. Ms. Jess said Driftwood pushes many of the students into trying their independence beyond the classroom and home. At Driftwood, it’s the student’s responsibility to be prepared with what they need for the day’s activities and to eat well. 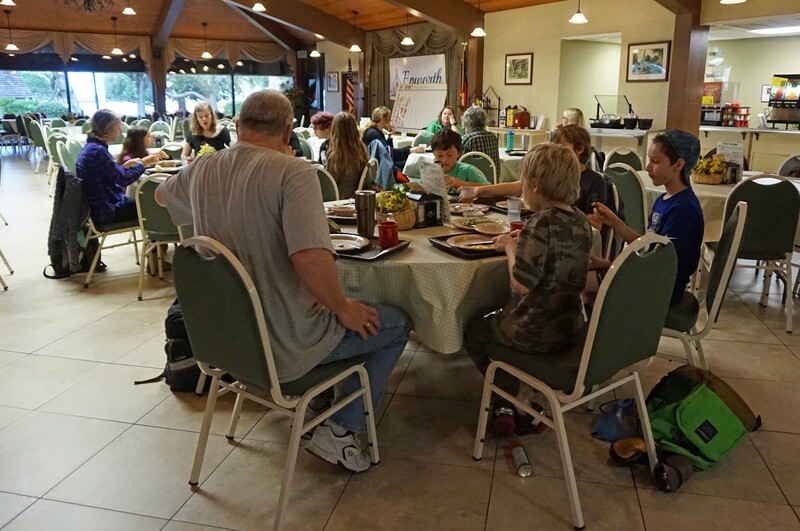 The Upper Elementary students eat together in the dining hall at Driftwood, and they encourage each other to watch out for ort. When it comes to eating at Driftwood, it’s all about ort, which refers to scraps left after a meal. Returning students encourage their classmates to get only what they can eat and to clean their plates at each meal. “We don’t want any ort” was a familiar cry at meals. 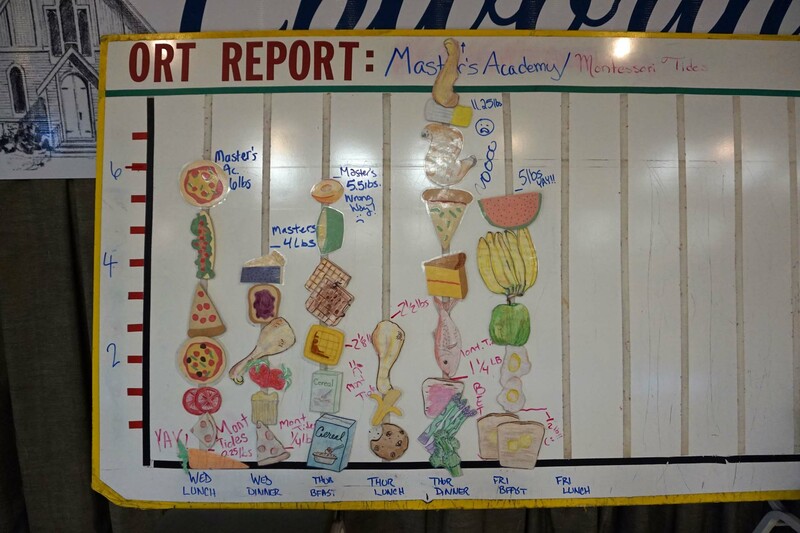 The reason: All scraps are weighed after each meal and placed on the ort chart in the dining hall. MTS was in friendly competition with another visiting school. Driftwood leaders also share facts about food waste and food production during meals to encourage everyone to make wise choices about their food. A chart in the Driftwood dining hall keeps track of the ort left by Montessori Tides School visitors and the other school that was attending. Ms. Nancy said the ort tracking makes the students think about “how many other people that little plate of food can feed.” A parent chaperone said he learned from the daily facts that a vegan diet consumes a lot less water. Their first evening at Driftwood was spent building a landing module for a water balloon. After spending time building their containers for the water balloons, Ms. Carrie, their Driftwood lead, took them outside and dropped their creations into the splat zone while standing on a ladder. All the water balloons survived the first round, but fewer and fewer lasted as she climbed the ladder. 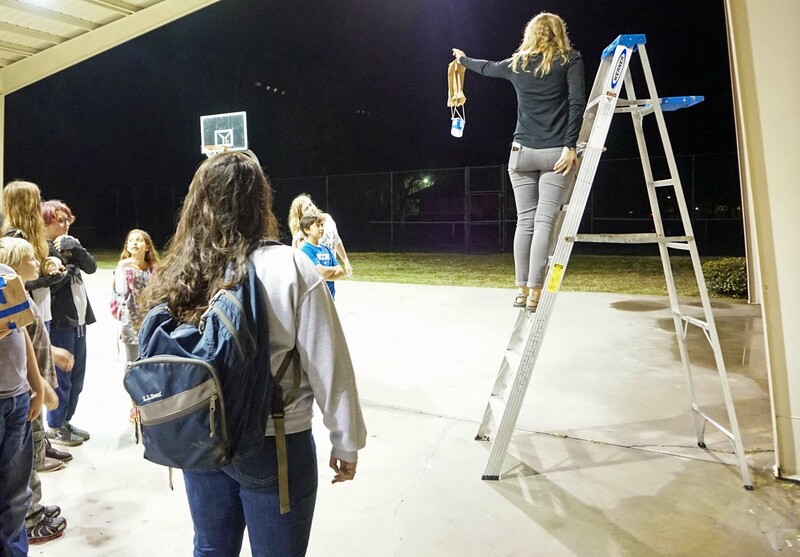 The students used common items, such as bubble packaging and toothpicks, to build a container to help a water balloon survive a drop from a ladder. On their second day, the students spent their morning as hydrologists. They learned about zooplankton and phytoplankton. They looked at the water they collected from the intracoastal through the microscopes. They later hiked to the public pier to conduct tests on the intracoastal water for such things as acidity, salinity and turbidity. during the Gator Tales session. The highlight of day two, though, was the session Gator Tales. Ms. Carrie introduced the group to a Florida king snake, a ball python, an American alligator, a gopher tortoise and a diamondback terrapin. If they wished, the children were able to hold or touch most of the animals. 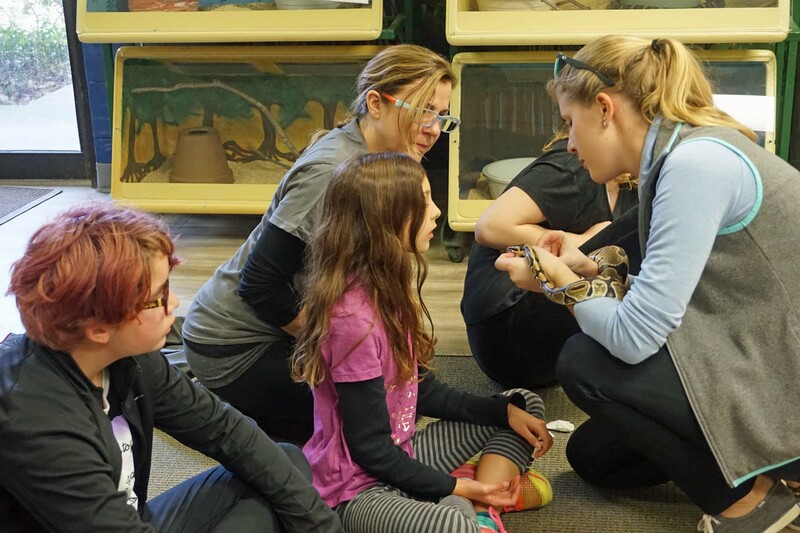 They learned how to distinguish venomous and nonvenomous snakes, and they learned that the ball python actually has small claws on its body. They also heard Ms. Carrie speak about the importance of gopher tortoises since they are a keystone species. They finished their afternoon activities with the comparative fish dissection, where they compared a striped mullet and a Black Sea bass. The evening session was spent around a campfire, telling stories, singing songs (The jellyfish, the jellyfish, the jellyfish, the jellyfish!) and making s’mores. 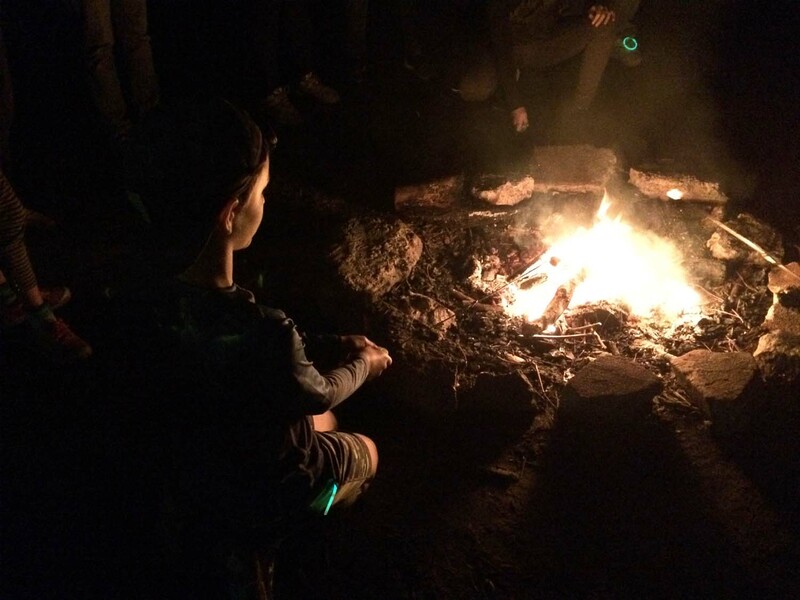 The Upper Elementary students made s’mores at the end of their evening around the campfire. Their final morning was spent in another team-building session. For one activity, they had to help each other get through a maze without using their voices. The maze of colored squares had no clear path: They had to repeat the correct steps the last person took and try a new square for the next step. If the choice was wrong, the next person was up. If the choice was correct, that person kept going. An Upper Elementary student gets nonverbal help on which square to move to next during a team-building activity. Ms. Carrie wrapped up the activity with an encouragement circle, similar to the acknowledgements the children are used to at school. One student said of the activity, “Everybody played a part, even if they didn’t find the right square” because they eliminated one square for the next person.